Tabs Out | Bolt of Void – Live Snakes! 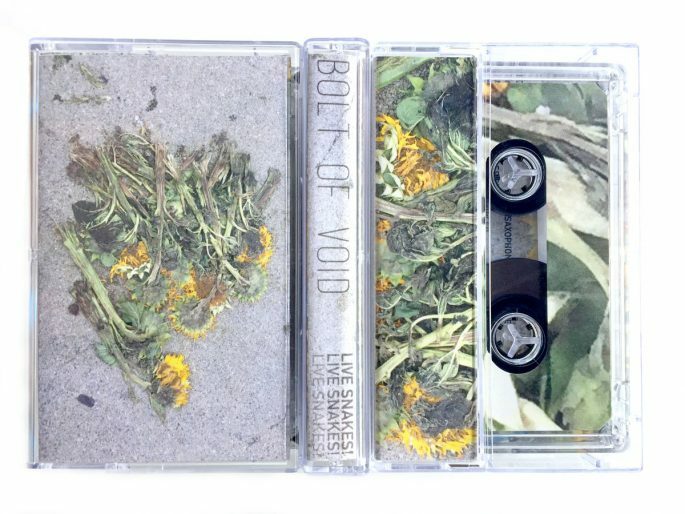 Bolt of Void – Live Snakes! Look, you’re only going to be disappointed, as I was, when I opened up this Norelco to find a grand total of zero live snakes. There weren’t any dead ones either, like Bolt of Void tried to live up to their promise but failed, not realizing that snakes need air and water and food and stuff like that to live. They can’t live inside a tape case or an envelope. No animal can. Crushed with disappointment, I popped what was ACTUALLY in the case – a cassette – into my cassette player, ready to just be in a bad mood for the rest of the day. Fortunately, although the tape itself didn’t live up to its name, the band sure did! Like an electric shock of negative energy interacting with dark matter, Bolt of Void’s screeching skronk-fusion blasted out of my speakers with enough energy to power a small city for a few hours. Like Charlotte, North Carolina, or Wilmington, Delaware. I don’t live in Denver, but I want to see Bolt of Void live. Seriously, people, the energy – imagine experiencing this in person, let alone the cassette artifact of it (which I’m experiencing today). I’m even almost over my snake disappointment, that’s how much my outlook has shifted. Still, it’s worth reiterating this disclaimer before you buy one of these tapes directly from the band (which you should): there are NO live snakes contained within, so don’t get your hopes up. Edition of 50.